Short Info:- (Central Board of Secondary Education(CBSE)) has recently notified the candidates by releasing the CTET Online Form 2019. The declared post is for the Central Teacher Eligibility Test 2019 (July 2019). The notification is available on the official website i.e. www.ctet.nic.in. Candidates can go and check all the information regarding this post. The registration will start on 5th February 2019 and it will be going till 5 March 2019. The authority is offering some great possibilities for the aspired candidates. Desired candidates can grab this job by crack this examination. Yes, there is a huge no of candidates who want to be a part of the education department. They have a great chance now to make their dreams come true. Aspirants are advised to check the official notification before applying for CTET Online Form 2019. 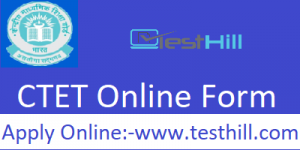 All essential information regarding CTET Online Form 2019 is provided on this page as well, so read it completely to stay update for this examination. The authority is decided to conduct the test on 7 July 2019. Senior Secondary (or its equivalent) with at least 45 % marks and passed or appearing in final year of 2-year Diploma in Elementary Education will be considered to this post. Candidates who want to go to the teaching profile have a good chance this time. But, they have to make sure that whether they are eligible for this post or not. One can know about eligibility by visiting the online website. The eligibility criteria include the institutional qualification, age limit, and applying fee etc. They have to make sure that all the data they have provided is authentic as the authority will validate all the applications after submission. The administration will only accept the correctly filled applications. Any type of correction fraud will not be accepted by their side. All candidates are advised to apply in the declared post before the last date. the last date of CTET Online Form 2019 is 5 March 2019. The official portal will be closed after the last date. All modes of online transactions are available on the official website, you can select the suitable link.